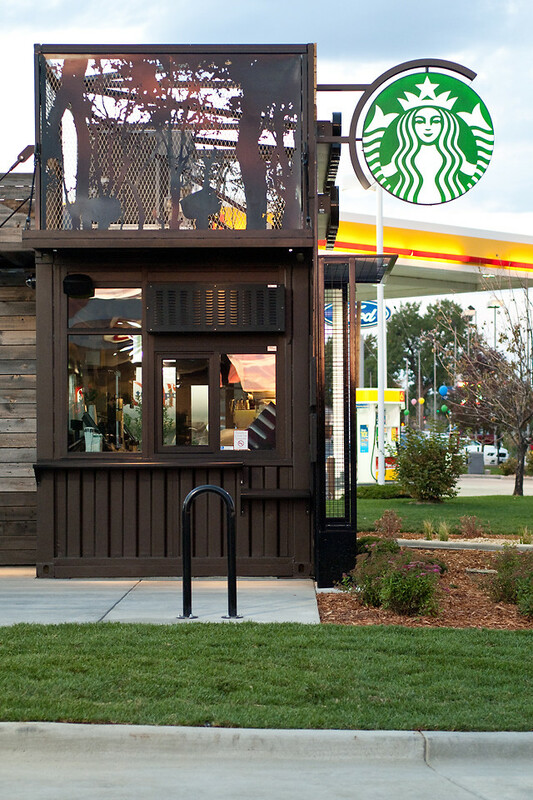 A new style of smaller, LEED-certified Starbucks may touch down near you soon. It’s all part of a plan to evolve the coffee giant’s business. New Starbucks in Denver, CO.
What would the flannel-wearing 1990s Starbucks say? Rubinfeld remembers when Starbucks wasn’t a trenta-sized juggernaut, but a longshot beverage company. Rubinfeld left the company for a bit, and when he came back in 2008 to take his new seat, the world had changed. No one would call Starbucks a risky business model anymore, nor would they dare finger coffee as a fad. 17% of U.S. adults were consuming a gourmet coffee concoction on a daily basis. Today, coffee’s grown bigger than soft drinks–and it has a two-digit market lead over those fizzy beverages. A transparent design glows in the morning. But other things had changed, too. Premium coffee had become an addictive enough habit that Starbucks didn’t require the sloppy seconds of grocery stores or business complexes anymore. A frappucino alone could be worth a trip. At the same time, the local omnivore movement was taking off. Laptops no longer just browsed the Internet, they created it. Culture became about content creation and original voice. And the very definition of cool had changed. Flannel-clad rejects were out, but geeks of all types were in. Teens were wearing backpacks on two shoulders and caring about the environment. Coming back in 2008, Rubinfeld tied all future store designs with the company’s Shared Planet Initiative, which impacted everything from Starbucks’s practices with farmers to how their stores dispose of refuse. “Once that connection to our mission statement, our soul if you will, was established, that became the go-forward design foundation for our stores, along with one additional very important element, and that is being locally relevant.” But one very big challenge remained. This was a question that Rubinfeld posed to Starbucks’s 14 architectural offices around the world. You see, Starbucks doesn’t hire out their building design. They conceptualize all stores from within. And what resulted was the greenlighting of a series of coffee shops that are absolutely stunning, highly individualized, sustainably idyllic flagships that easily challenge Apple’s best stores in terms of pure chic. One particular flagship was built right in Seattle, using Starbucks’s reclaimed shipping containers along with prefabricated components. And while Rubinfeld admits that it’d have been cheaper just to ditch those shipping materials altogether, he liked the statement. It was experimental, green, and gorgeous. It was ostentatious and responsible at the same time. Starbucks, of course, can’t afford to be totally idealist. They still have market challenges of their own and, sooner or later, there are only so many large coffee houses you can build and expect profitability. Rubinfeld describes the issue as one of neighborhood-level demand. Starbucks sees countless markets that might exist, but each is a bit too small to sustain a traditional store with larger square footage. Their new building paradigm–officially labeled a “pilot program”–is a confluence of all these various impulses. The environment. Localism. Market growth. Low-cost, low-risk expandability. And making it all come together is the responsibility of Anthony Perez, a senior concept design manager who envisioned Starbucks’s original prefab store. “To both build scale while having things be locally relevant, that’s really a designer’s problem to solve,” Perez tells me. “It’s a really, really challenging problem.” But it’s not an impossible one. The core of each of these new, small Starbucks locations will be a prefabricated, modular set of rooms. At a mere 500 square feet, they have just enough space to squeeze in three to five employees along with all of the coffee making apparatuses necessary to execute a full Starbucks menu. That core structure is likely every bit as generic as it sounds. Perez sees this facade as both a literal and metaphorical layer to the building that can make a mass-produced corporate product into a relevant place to the community. It even leaves room for “art panels.” Much like coffee shops will hang pieces from local artists on the walls, Perez wants to see these rear illuminated exterior panels serve a similar function–to push individuality and maybe even local artistic voices. These buildings will also glow, enticing the blurry-eyed consumer in. Some might see that last tag-on as lip service, but from an awkward set of moments and questions that followed, I inferred that Perez had just spilled the beans on something much bigger. Consider the small, modular locations. Consider the LEED certification. Consider the power savings of a drive-up business that doesn’t need to feed electricity to laptops all day. Starbucks might not just be designing modern modular locations that are off the normal consumer grid–they could be designing low-footprint stores that eventually go off the grid altogether.